This guide is useful for calibrating and sourcing speedometer gears for your Jeep transfer cases, ranging from the early New Process units (starting in 1980), the Dana 300 (starting in 1981) through the later New Process units made until 2006. The tooth counts are applicable whether its a cable-drive speedometer, or a Vehicle Speed Sensor (starting in 1992) style assembly. RockTrak NP241OR's do not apply since they are natively and directly electronic speed sensing. The output shaft drive gears are all spiral-type, featuring 13 (effective) teeth. Dana 300's may feature fewer drive teeth, but have the same pitch as a 13. The chart below show the mating driven gears. As a quick reminder, if you choose a smaller driven gear, the speedometer will be driven faster. If you choose a larger driven gear, the speedometer will be driven slower. Many charts on the web are innacurate. These figures below derive from actual individual calculations based on tire diameters and industry-standard formulas. Be careful to measure your actual tire diameter instead of relying on published numbers from the tire manufacturer. The colors below represent the typical colors for these driven gears. Note that different tooth counts can have the same colors. Tire Dia. / Axle Gears 27" 28" 29" 30" 31" 32" 33" 34" 35" 36" 38" 40" 42" 44"
In 1992, Jeep began to use Vehicle Speed Sensors, and essentially used the same color coding and calibration system as the cable drive speedometers. 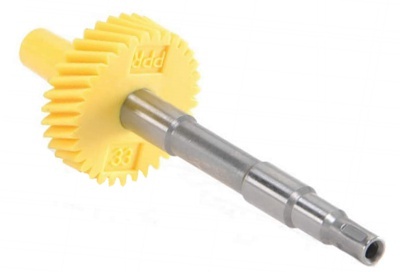 However, VSS style driven gears have a shorter shank and are only compatible with VSS style senders. 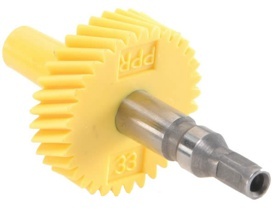 Some sources wrongly list these gears as compatible with 1955-1992 Jeeps. This is innacurate, unless an earlier Jeep has received a later transfer case.